XERIC is designed and engineered for the most challenging applications. Ideal for handling a wide variety of materials which are often considered unpumpable, the 70200 offers a practical solution for tough pumping problems like highly viscous, abrasive, shear sensitive, or solid-containing materials. The pin joint design has few wearing parts creating long, trouble-free performance. If service is necessary, you can count on simple, low-cost repairs; saving you money and time. Available in a full range of sizes from one-, two-, or three-stage designs the 70200 offers simple options to suit a wide variety of applications. Sometimes you need a pump that can handle higher pressures, viscosities and torque. Applications like these require the 70300 or 70600 models which feature oversized drive ends. For the 70300 the next larger drive end design is used with a standard 70200 element. The 70600 is customized with a drive end that is 2 times larger with a standard 70200 element. As a result, either model can handle high-pressure spraying, chemical injection into high-pressure lines and applications involving pressures above 225 psi. The 70300 series also allows you to use the standard design, normally rated to 75 psi and 600 RPM, in applications which call for their full element ratings. Standard pumps offered in the 70300 series are three, four, and six-stage pumps. In the most demanding jobs where the torque, viscosity, pressures and abrasion resistance are exponentially high our gear joint style 70400 series is the perfect fit. The 70400 series pump is designed and built for applications where joint life is critical. The crowned gear joint design is sealed from the liquid; providing a drive system with a greater wear area and lower stresses making it the superior design in joint technology. Its construction makes this gear joint pump ideal for applications where a longer maintenance interval is desired, accessibility to the pump is limited or where downtime must be kept to a minimum. Also, because the 70400 series gear joint pump comes standard with large clean-out ports, large objects can be removed from the suction housing without dismantling the pump. Its solid drive shaft makes the 70500 the ideal choice for handling liquids with a tendency to set up -- and eventually build up -- in a hollow-shaft model. That includes thermosetting adhesives, concrete, grout, plaster and other materials which have the potential to harden inside the shaft. When these materials are allowed to build up and harden, they inhibit free movement of the connecting rod, resulting in connecting rod breakage. In designing the 70500, Roper Pump Company engineers moved the pin joint connection from the middle of the drive shaft out to the end. This modification moved the connecting rod within the suction housing where material can be easily flushed. 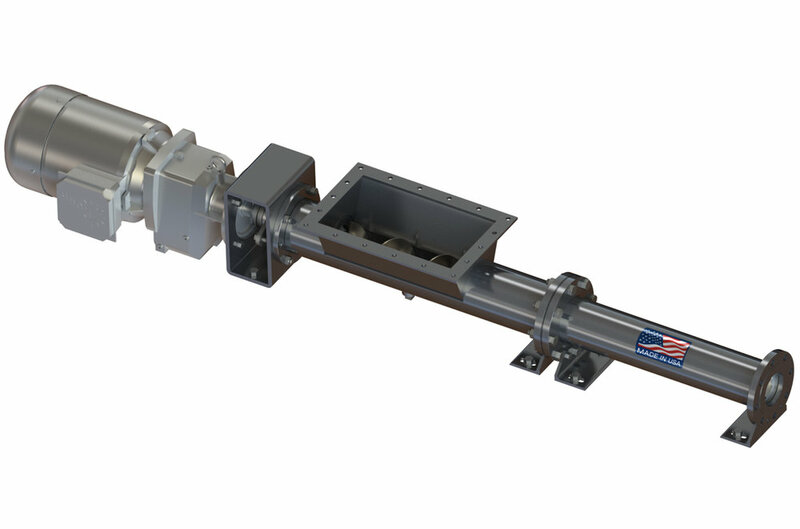 If you're faced with pumping extremely high viscosity or semidry materials that won't flow easily through a standard suction port, you'll be interested in the 70700 series of hopper feed progressing cavity pumps. The 70700 replaces the standard suction housing and circular ANSI flanges with a large rectangular hopper with sloped sides to facilitate material movement into the pump. The extra-large hopper is designed to accommodate extremely thick or dry materials that have a tendency to bridge with other manufacturers' pumps. Therefore, with the Roper 70700, a bridge breaker is normally not necessary. From the hopper, materials are simply auger-fed to the pumping elements by a specially designed flighted connecting rod which replaces the connecting rod normally found in standard progressing cavity pumps. So fluids that won't flow through a standard flange -- including heavy slurries, filter cake and greases -- will move steadily and reliably through the 70700 pump from Roper.